After a great day exploring Melbourne on our feet, we signed up for a day tour. 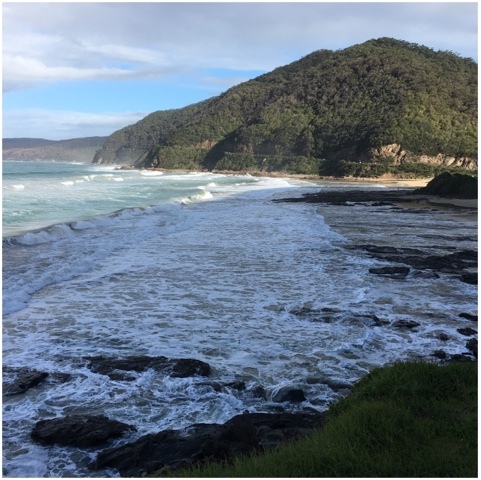 mrC and I both love the ocean, so traveling the impressive coastline was an easy choice. 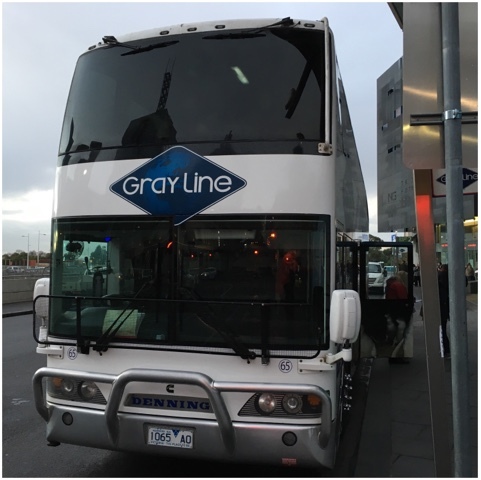 Gray Line Day Tours - our hotel recommended this company and after reading many great reviews on Trip Advisor, we booked our tour. The pick up location was only two blocks from the hotel, free wifi was offered on the bus and you stayed with one guide all day. Our contact at the hotel advised us to grab the upper level front row seats on the left side of the bus. Best tip ever! It is worth it to talk to the concierge at the hotel even if you decide to book things on your own. 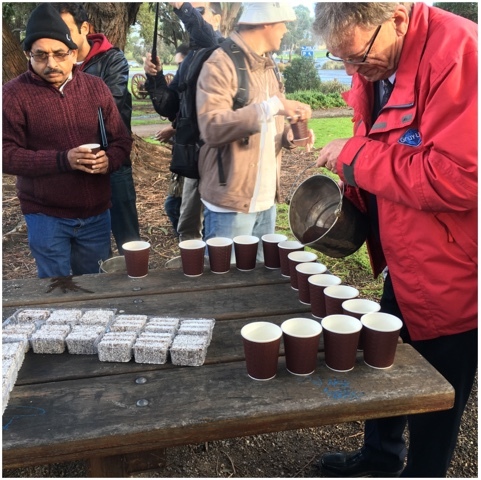 Aussie style Bush Billy tea - our first stop of the day was a little park in Anglesea for some Bush Billy tea (tea made in a billy can) lamingtons, (in the picture below) Vegemite (popular Australian spread) and crackers. I loved being able to try out some local treats. 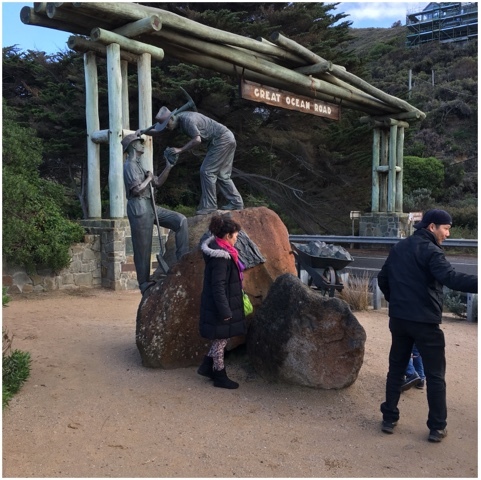 Memorial Arch - Great Ocean Road was built by veterans returning from World War I and dedicated to those who lost their lives. The road is the largest war memorial in the world. There is also a beach entrance here with amazing views of blue waters meeting golden sand. Surf Coast - the first part of our ride along Great Ocean Road we saw golden sandy beaches, rolling surf perfect for surfing, and beautiful mountains meeting the water. 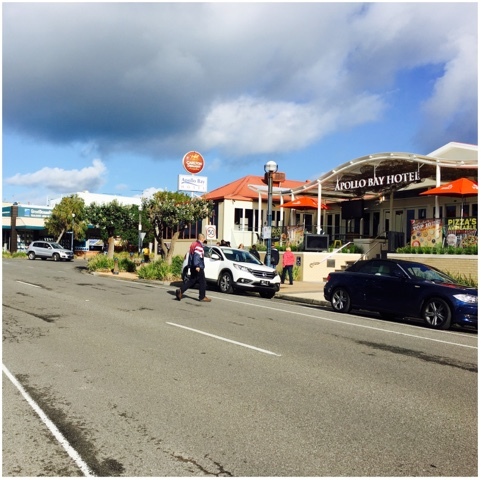 Apollo Bay - We stopped for lunch in this popular holiday resort town. We had lunch at the Scorched Grill. We sat at the bar facing the front window where we could people watch and see glimpses of local life. 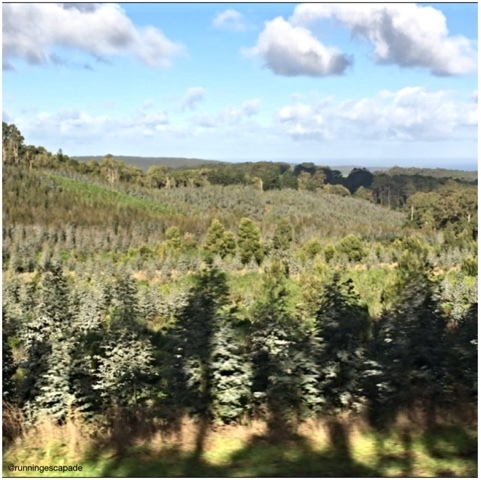 Otway National Park - Another part of Great Ocean Road passes through the Otways, an Australian rainforest full of fern gullies and eucalypts. 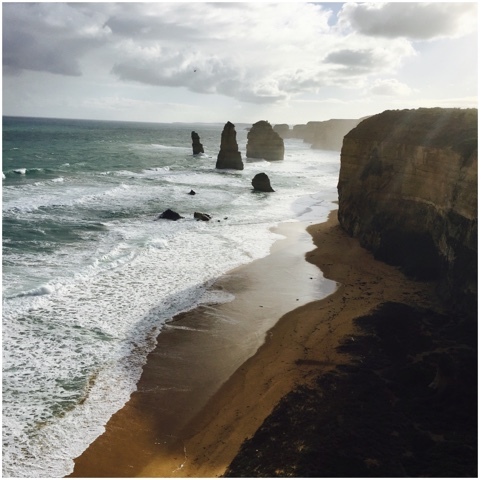 Twelve Apostles - They can be found at the final destination of our day tour along the area of coastline known as Shipwreck Coast. They are huge stone monoliths off the shore caused by constant erosion from waves and wind. Once part of the mainland, the erosion first formed caves which became arches up to 45m high that eventually collapsed leaving the limestone stacks standing cutoff from the shore. There were stunning views from an observation deck, but the Gibsons Steps that lead down to the beach were closed. 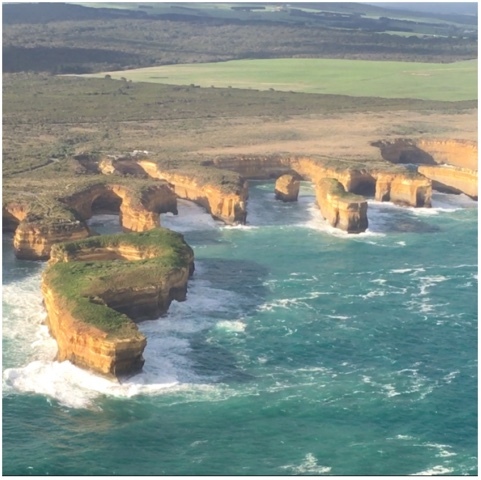 Helicopter Tour - we signed up for the optional 15 minute air tour to get a bird's eye view of the Twelve Apostles plus other natural landmarks like London Bridge, Seahorse Rock, and The Sentinel. The views were amazing! The only downside was not being able to hear the pilot very well. He was describing everything as we flew by, but I missed most of it. It was still beautiful though. 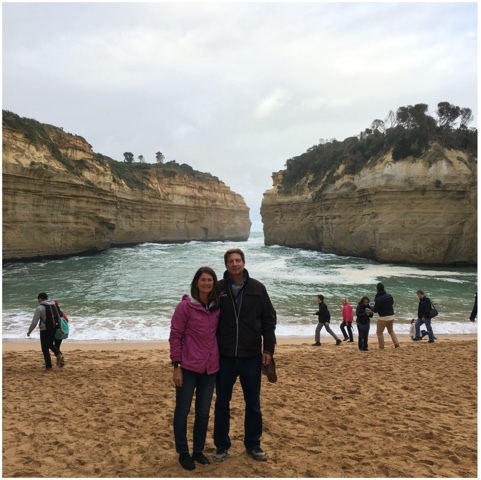 Loch Ard Gorge - Named after the Loch Ard, a ship that tragically ran aground and wrecked. 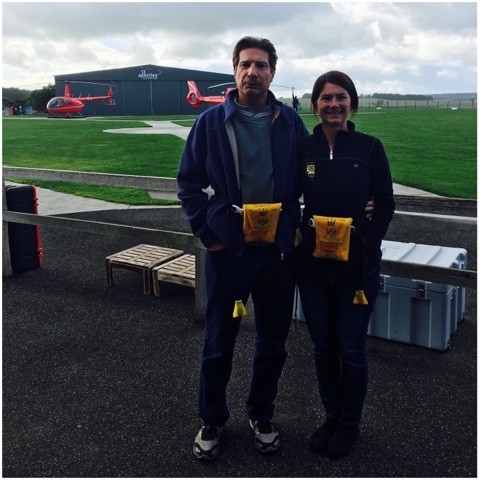 There were two teenage survivors, Tom and Eva, who were sheltered in the gorge before being rescued by locals. Near the gorge are two unconnected rock pillars that have been named after the two teenagers. We were able to walk down to the beach to get a feel for how high the cliffs really are. Coming up - our ride on a steam train and playing with the animals. Sprints and Sprinting to the Cape!